Brandt Snedeker ... golf's greatest putter? As one of the shorter hitters and with mid-range statistics for most other facets of the game, it seems that Snedeker's putting is what has given him the chance to compete among the very best. Date of birth: December 8, 1980. Claims to putting fame: Best putting statistics on the PGA Tour so far for 2013, averaging 1.6 putts per green for one tournament, as well as the most birdies of the season currently. Won the Fed Ex Cup in 2012. 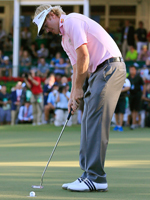 What you can learn from Brandt Snedeker's putting? Snedeker has largely modelled his techniques from all aspects of his game on his childhood hero, Tom Watson. So sure enough, he, like Watson, is a quick player who sticks to old-fashioned views of the game. Just a quick look at Snedeker's routine will justify claims that he has emulated some of the aspects of Watson's putting. When watching Brandt Snedeker trying to read a putt, you will see him walk halfway between the ball and the hole on medium length and long putts, and at the same time use his feet to feel the green as he walks. What this does is help to feel the line of the putt from the high side of the hole. After a long and thorough examination of the putt, however, you will see that Snedeker pulls the trigger much quicker than most after having addressed the ball. You must realise though, that this is not a 'rushed' action, but in fact one with a purpose. Hitting the putt as soon as he is ready means that he has maintained the feedback he has just gained from reading the green. Snedeker has always been a fan of the mallet style putter, and has used one ever since he found one that he liked while playing at college. His current putter, an Odyssey White Hot Rossie 2, has been in his bag for nearly seven years. With the XG insert, he feels it is both soft and easy to align when setting up to the ball. "I've only changed the grip once in the seven years that I've had it," said Snedeker. "It's only 34 inches so I've had a bit of lead tape put on the bottom of the head to make up for the weight loss - I like to feel a little weight in the stroke." 1) Try and replicate the feeling that the shaft is travelling through your forearms. This will, in turn, keep the putter on the correct path and stop the face from turning. 2) For the right-handed player, keep the pad of your left hand against the putter face, a trait which many tour pros today have adopted. 3) Simplify putting - Never concentrate so much on the line of a particular putt, but rather, in Snedeker's own words, "give the ball a chance to go in."